Our female playwrights from the 2017/18 season included Kate Hennig (The Last Wife), Évelyne de la Chenelière (To the Light), and Tracey Power (GLORY). Since Hennig’s world premiere of The Last Wife at the Stratford Festival in 2015, she is quickly becoming a household name. The Last Wife is the first play in Hennig’s Queenmaker Trilogy. Since its premiere the play has been produced across Canada and North America and has received consistent praise for its poignant themes and sharp dialogue. 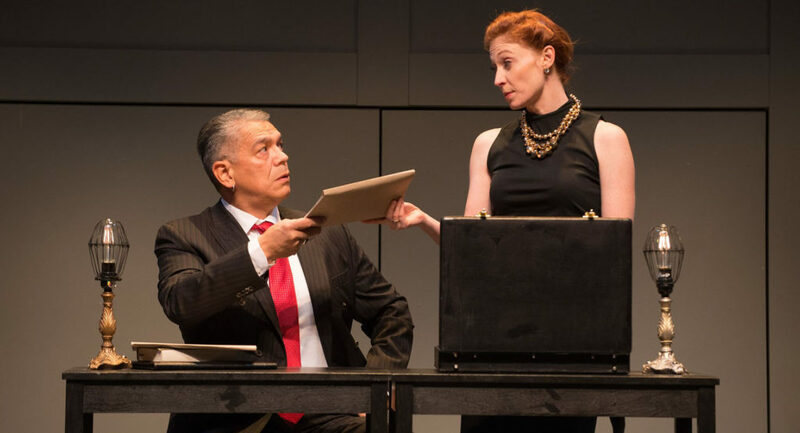 The second installment of the trilogy, The Virgin Trial, starts September 11 in the Martha Cohen Theatre and runs until September 29. The Virgin Trial is a modernized account of young Queen Elizabeth I’s political and sexual scandal that set the stage for her to be dubbed the Virgin Queen, and has been reviewed as even better than The Last Wife. Hennig is currently writing the trilogy’s third installment, Father’s Daughter, which will focus on the story of Mary, known commonly as “Bloody Mary” for her persecution of Protestants. Hennig found inspiration for her trilogy in the 2011 political events and media coverage that surrounded the Arab Spring. Hennig pondered the lack of women’s stories in this historical events. She was then inspired to search her own cultural ties where women’s voices and stories are largely absent. She then landed on the notorious Tudor king, Henry VIII. Oscar-nominated writer Évelyne de la Chenelière premiered the English translation of her play Lumieres, Lumieres, Lumieres, translated to To the Light, in October of 2017 at ATP. 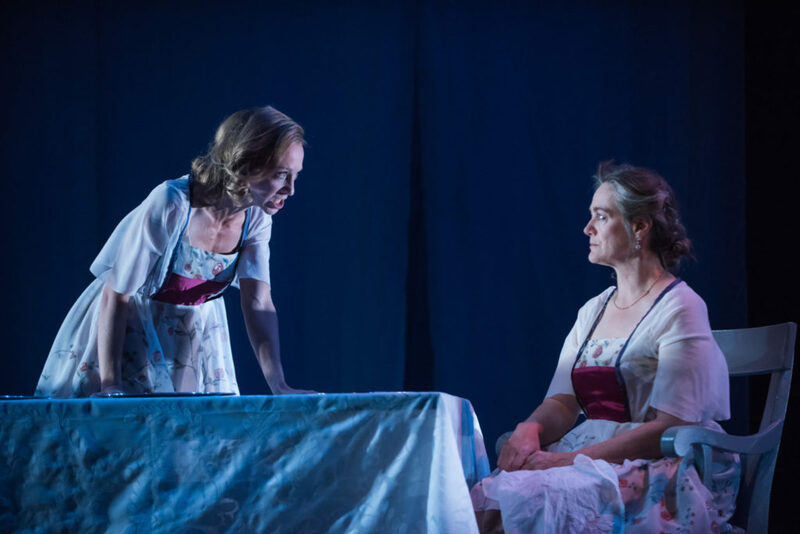 Incorporating live music, poetic text and striking visuals, To The Light explores the friendship between two women who are at once drawn together and torn apart by the roles they have embraced as women in the early 20th century, one a mother and society wife, the other an ambitious but struggling career woman. The play is based on Virginia Woolf’s 1927 novel, To the Lighthouse. This production marked ourATP’s second presentation of a play by de la Chenelière, after we premiered an English translation of Strawberries in January as part of our 2002-2003 season. Photo of Actors Elinor Holt as Mrs. Ramsay and Julie Orton as Lily Briscoe by Benjamin Laird Arts & Photo. We closed our season with the world premiere of GLORY by Tracey Power. 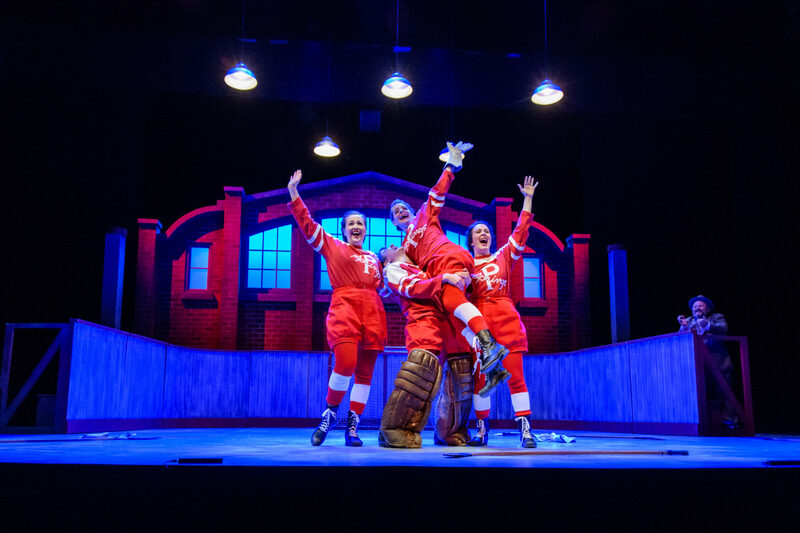 Inspired by the true story of Canada’s first national female hockey league, GLORY tells the story of four friends, Helen, Marm, Nellie, and Hilda, who set out to prove that hockey isn’t just a sport for men. But with The Great Depression weighing heavily on the nation and political tensions rising in Europe, the team faces an array of obstacles. GLORY is told through original music and dance inspired by the era, with choreography also by Power. An award-winning Canadian playwright, director, actor, and choreographer, Power found inspiration to tell the story of GLORY from a book of historical Canadian photographs, which included ones dating from 1910 to 1915 of women’s hockey teams with the players in very long skirts: this team was the Preston Rivulettes. Our commitment to female playwrights alongside dozens of other theatres across the world means that the stories we choose to tell will be increasingly representative of the female perspective and voice. Our 2018/19 season includes Kate Hennig’s highly anticipated sequel The Virgin Trial, and a world premiere play by a Canadian female playwright: ZORRO: Family Code by Rebecca Northan. Our season also includes Café Daughter, the one-woman show based on the life of Chinese-Canadian and Cree Senator Lillian Eva Quan Dyck, and Rosencrantz and Guildenstern are Dead, Tom Stoppard’s classic, Tony Award-winning play by Calgary’s own Shakespeare Company wherein they’ve cast two women in the traditionally male title roles. Learn more about our new season here!